Should Lucy Muthoka have faced charges? 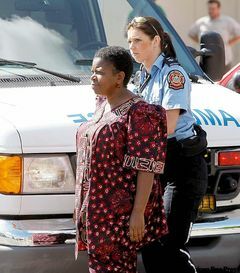 Lucy Muthoka — the Winnipeg woman who killed two Manitoba men with her car in a massive downtown crash on June 25, 2008 — should never have been criminally charged. That’s my personal view of the case, based on the outcome of it, decided yesterday at the law courts building. Notwithstanding the grief the dead men’s families feel, and their views that they were treated unfairly by the legal system — the way this case proceeded and ended all points to a tragic accident having taken place. Let’s look at the timeline. June 25, 2008: the fatal crash at St. Mary and Donald. William Halcrow and James Ross are killed and David Matsubara is seriously injured. Dec. 11, 2008: Muthoka is arrested and charged with two counts of criminal negligence causing death. The homicide-related charges reflect the seriousness of what happened, reporters are told. They were laid in consultation with the Crown’s office. Remember, it’s been more than six months that the crash happened. There’s no allegations that drugs or alcohol have anything to do with what happened. The case winds its way through the courts for more than a year. Muthoka is out on bail, given that she has no priors, is a valued federal government employee and is considered a leader in Winnipeg’s African community. The Crown accepts her pleas in full answer to the men’s deaths, and basically telegraphs to the court that no jail time would be sought. Under the Criminal Code, Muthoka faces a maximum 14-year prison term, however the court has ordered a pre-sentencing report be drawn up by an agency that specializes in community-based sentencing alternatives. Neither the Crown nor Simmonds made any comment at the hearing about what sentence they are seeking in the case. Friday Aug. 20, 2010: More than two years after the crash, Judge Brent Stewart, Muthoka, the lawyers and members of the victim’s families gather in in a courtroom to decide Muthoka’s [clearly pre-determined) fate. The Crown takes no position. Muthoka, a religious woman, apologizes for what happened and has to hear the victim impact statements of the families of the men she killed. In passing sentence, the judge declares that the courts are not courts of vengeance and suspends Muthoka’s sentence, bars her from driving for 10 years and hands her two years of probation. Conditions include many “restorative” principles, including mediation with the victims’ families if it can be done, and community service of 240 hours. Halcrow and Ross’ families leave upset, feeling justice wasn’t done. But let’s be honest: There’s no way locking Muthoka up — for any period of time — would satiate their grief in any way in the first place. If the end result of the case was this and was always thus, I ask what the point of charging her in the first place was. The Crown signs off initially on two very serious homicide-related charges, reduces them on plea and ends up taking no public position as to sentence. It’s pretty clear there was little interest in prosecuting this case. And, it appears there was little public interest in doing so either, given the sheer number of people commenting on stories about the verdict that echo exactly what I’ve said here. The charges should have been stayed a long time ago and the whole incident seen for what it was: a tragic accident committed by a novice driver who is sincerely remorseful. If I’m not mistaken, MPI could have imposed the driver ban, which is probably the most harsh aspect of the whole judicial punishment. But I have to ask: If there was evidence to lay criminal negligence causing death two years ago, what happened to it? PS: I was at the provincial court counter when Muthoka was signing her probation order. She was with a friend/support who kept glaring at me, I guess sensing I was curious about Muthoka, or somehow knew I was with the media. She and Muthoka slipped out the Woodsworth Building entrance, thus avoiding any possibility of a confrontation with the victims’ families or the media. A smart defence lawyer handling a high-profile case always tells their client to come and go by this route. PPS: I call ‘boo’ on the scheduling mishaps that took place with Muthoka’s case on Friday, which make me wonder if there was a deliberate attempt to keep the sentencing out of the papers or other media. After the last June 30 remand date, the sentencing was set for 2 p.m. Aug. 20 in courtroom 404 – the provincial court side of the Law Courts complex. When I turned up at court on Friday, the docket reflected exactly that. 2 p.m., 404. But, turns out about a week ago, it was quietly rescheduled for Friday morning in a courtroom on the second floor of the Queen’s Bench [old Law Courts] side of the building. And then it was bumped down a floor to another courtroom just before the hearing started. No note was placed on the door of courtroom 404 to advise of the change, and it’s really surprising the docket wasn’t altered to reflect the new time and courtroom, as that’s been pretty standard practice for some time now. Thanks to Global Winnipeg’s Jeff Keele for being on the ball and filling me in on what happened. This is unrelated to your post/blog (which I enjoy reading btw), but why are you the only CBC news writer who gets a byline on all your web stories? For the longest time it was just ‘CBC News’ but I’m seeing your name more often now. Anyways, keep up the good work James! Hey Matt, thanks for the comment. The reason for the bylines is simple. I do all the work [including finding the story and researching it] so I get the byline. If a story is re-purposed from broadcast scripts and was someone else’s, no credit is given, as it’s considered a ‘team’ effort. CBC gets a defacto courts reporter in Manitoba and everyone seems happy. Except my girlfriend and dogs, who I never see during the week. I’m also planning after 1 year of working for .ca (Sept. 1) of showing them the benefits (by way of page view tracking on the site) of having more content written by reporters, not just reworked by web writers. One of the greatest strengths of the WFP’s and Sun’s web systems is that the reporters are by and large responsible for filing short items to the web during the day. That’s different than the CBC experience, for a number of reasons. I strongley disagree with you. If it was a white male, he would have been given a jail term but here we have a black female who was gieven everything including a government job who now is free. What about the families of those that were killed? Yes, they are only Native so no sense in worrying about them and no I amm not native and I did work for the government and seen how these people got hired. For once start thinking of the victims and yes send her back to where she came from. If the ‘victims’ had been killed by a fallen tree, we would have just called it a tragedy. Just because a human was involved in their deaths does not make it a crime, it can still just be a tragic event. If it had been a white male, with upstanding community involvement, no record, good job, same lawyer, it would have been the same result. That being said, the process in Winnipeg is generally, lay the charge we think we’ll have evidence for, and see what happens on the trial date. I think it’s backwards- matters shouldn’t have to be set down for a trial 8 months away, when everyone involved knows that nothing is going to happen on the trial date. It’s a complete waste of resources. That being said, crim neg isn’t the easiest charge to prove. It’s a difficult legal test to determine whether or not the behavior was a ‘marked and substantial departure from the reasonable standard of care.’ Not a slight departure, not an uncommon departure, not just a careless departure. And don’t even get me started on the legal test for a reasonable person and the ‘objective-subjective’ part of the test. I believe she should have been charged and feel that she was very lucky with what she got. Now this could have been her, http://www.cbc.ca/canada/manitoba/story/2010/07/18/man-crash-mcphillips-templeton.html as I see very little that is different, except that she was an inexperienced driver that was taking lessons, which begs the question, how did she get a licence in the first place? By getting behind the wheel of a vehicle you are responsible for what happens while you are in control of that vehicle. We’ll see how her appeal goes. She wants the driving ban she was handed slashed by a number of years.